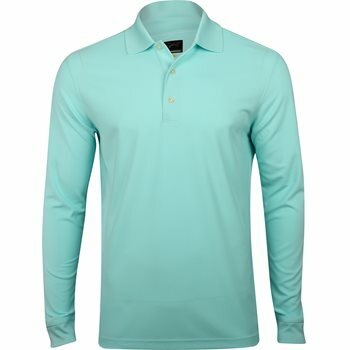 The Greg Norman Solar XP Weatherknit Long Sleeve Polo provides protection in all kinds of weather conditions. Solar XP technology provides sun protection without using chemicals. It features fine denier yarns that block harmful UV rays. Weatherknit includes several technologies to keep you protected, such as heat retention to keep you warm when the weather cools down, rain and wind protection, and PlayDry moisture wicking, a technology that draws sweat away from the skin to keep you cool and dry when the temperature is high. The Solar XP Weatherknit polo is easy to care for. It is machine washable and resistant to shrinking and wrinkles. The polo is designed with a knit collar, a reflective Shark logo centered at the back neck, and a 3-button placket for closure adjustability.